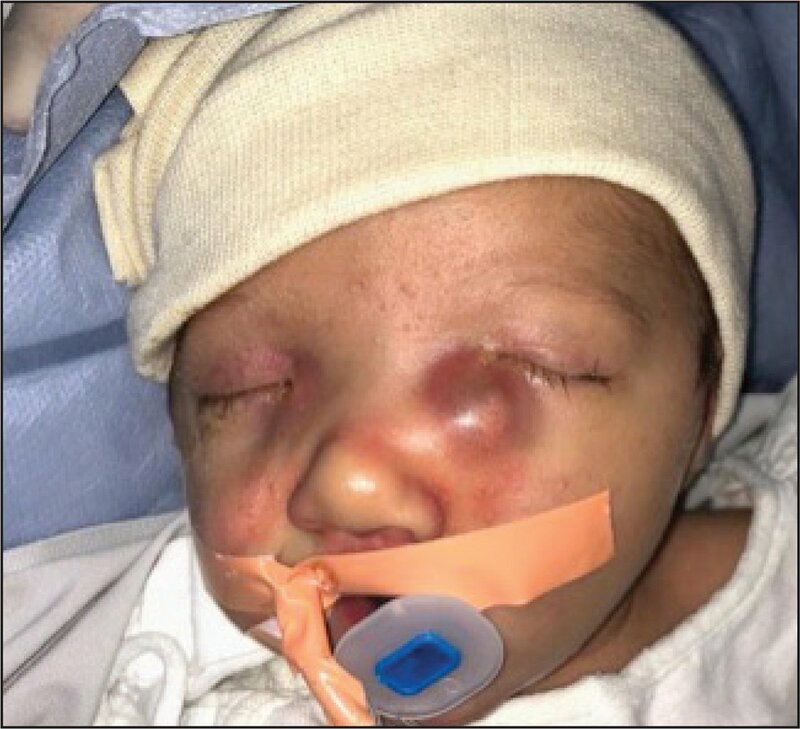 An 18-day-old female neonate presented to clinic with bilateral enlarging infraorbital bluish masses and mucopurulent discharge from both eyes. She was born full term with no complications during pregnancy and delivery. The parents noticed the swelling shortly after birth, with progressive enlargement mostly on the left side associated with labored breathing. Clinical examination revealed bilateral indurated cystic lesions with a bluish hue below the medial canthi, more prominent on the left side (Figure 1). There was overlying skin, soft tissue swelling, and redness. On digital pressure, copious mucopurulent material was expressed onto the ocular surface. The ophthalmologic examination was otherwise unremarkable. The neonate was noted to have audible grunting and respiratory distress. Computed tomography scan showed bilateral large cystic lesions in the lacrimal fossa area associated with intranasal cysts. At 2 months of age, she underwent bilateral probing and irrigations and has since done well. For the correct answer, see page 27. The answer for What's Your Diagnosis? is bilateral dacryocystocele. Carneiro de Sousa P, Neves M, Duarte D, Azevedo P. Congenital bilateral dacryocystocoele [published online ahead of print October 15, 2018]. Eur Ann Otorhinolaryngol Head Neck Dis. doi:10.1016/j.anorl.2017.10.006. From Department of Ophthalmology, American University of Beirut Medical Center, Beirut, Lebanon.